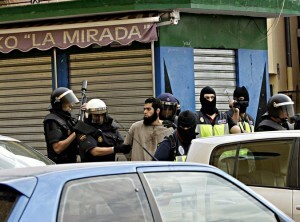 Spanish and Moroccan law enforcement officials have arrested nine people suspected of being part of a terrorist cell linked to the Islamic State, the Spanish Interior Ministry said on Friday. The ministry said the suspects had been arrested in Melilla, a Spanish-administered enclave on the north coast of Africa, and Nador in northeastern Morocco. The Spanish media said that those arrested included eight Moroccan nationals and one Spaniard, who was purportedly the leader of the group.